On July 15-30 the Summer School “Freedom Street” of the Platform of European Theatre Academies (PLETA) takes place in Rucka Residncy, Cēsis. 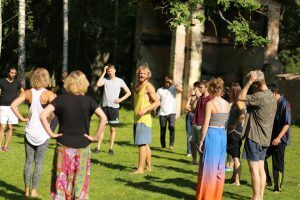 26 young theatre makers from 8 European countries are getting to know Cēsis and Latvia, and creating 6 site-specific performances in Cēsis city environment under the guidance of an international team of mentors. The audience is invited to join them on July 28 and 29. Time machine stops in Cēsis – this motto unites performances and actions on streets and squares of Cēsis city interpreting the concepts of history and freedom. Organizer: Latvian Academy of Culture and PLETA in collaboration with Cēsis Art Festival and Rucka Artist Residency. With the support of the EU Programme “Creative Europe”, the Ministry of Culture of the Republic of Latvia and Cēsis Municipality. The event is part of the international programme of the centenary celebration of Latvia.